The separate pack (TJ6051) comprises a straight pin, brass link nut, fasteners and 350mm (14”) radius bar. 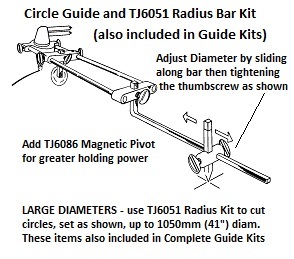 A maximum circle of 1050mm (41”) diameter is achievable when used with a Tanjant gas circle guide. The bar can be fitted facing upward or downward to suit the torch guide height. The brass lock nut adjusts up and down the pivot pin and along the length of the radius bar. Select the “How-to-Use” Button to see drawings. A Magnetic Pivot (TJ6086) offers even greater security to the cutting process. Tanjant’s Radius Bars may also be joined using the Link Nut to assemble a longer length for large diameter cuts.